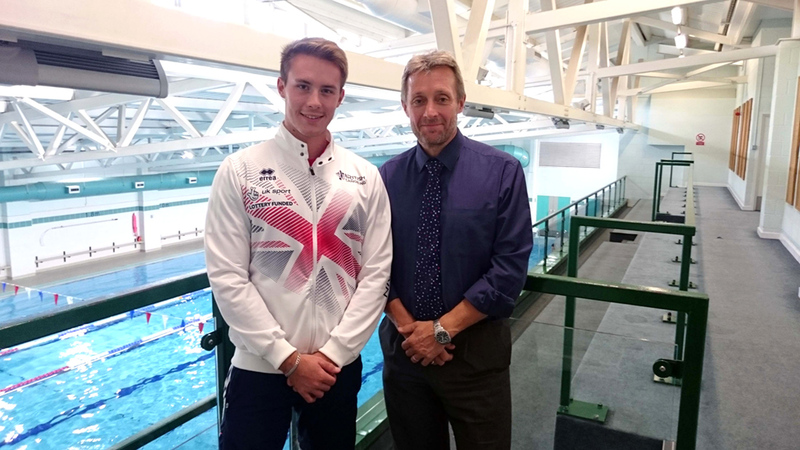 Charterhouse Club is throwing its support behind local aspiring Olympian, Chris Carson who is recognised for his world-class talent in Sprint Kayaking. Chris took up kayaking at the age of 15 and just 5 years on he has already achieved much in his sporting career, competing on an international level. Most recently he raced in the 2018 National Championships in Nottingham and became U23 National Champion, winning gold in the 500m K2 sprint. However, the 20-year-old from Shalford has had to overcome many hurdles along the way as he suffers with autism, dyscalculia, and dyslexia. Chris has also had to deal with a condition known as Sensory Integration Disorder. Despite these issues, and with the support of the Club, he has his sights set on competing in the Olympic Games. Chris now trains regularly at the Club and he has also embarked on a lifeguard course. Here we speak to Chris to find out about his sporting journey and what drives him. When did you take up kayaking? I was born in South Africa, moved to Dubai at the age of 4 and on to Budapest at the age of 9. I was 10 when my family moved to the UK and my school teachers quickly realised I was severely dyslexic. In my early teens I was bullied for being overweight and really struggled with academic work. Choosing to turn my life around I began running and within a year I lost 17kg. My mother signed me up for an Introductory Kayaking course in Guildford when I was 15. I loved it as it proved to be a real outlet for me and a new positive focus. My Mum and Dad are both sporty and have always encouraged me. My mother who was a swim teacher and competed in the Commonwealth Games in the 80’s has an undiagnosed rare brain disease. Despite this she has travelled to support me in all my competitive events. She is a huge influence on me as she shows such great strength. Also, Liam Heath the 2016 Olympic Gold Medallist in the 200m Canoe sprints. I was his training partner during a gap year and he really inspired me. Has kayaking always been a competitive sport for you? Following the introductory kayaking course, I just wanted to paddle faster and faster. For me it was always about speed and I had an immediate love of Sprint Racing. I worked my way through narrower and faster boats. I upped my training to 6 times per week by the age of 16. I went on to take part in my first competitive sprint race in 2015 in Nottingham. That November I was forced to race up an age category to U18 and made my debut in the Gent Canoe Marathon, Belgium. I came 5th in the Junior Men k1, 18km race, which was a huge achievement for me. When was your talent for sprint kayaking recognised? After Gent, I came back the following season and gained a record for the fastest progression up the rankings in paddling at the age of 17. I had made it into the top category in the National Rankings. By this point I was taking part in marathon races and sprint races on a national level. I was also selected for the Junior Sprint Race Team and then made the Marathon Development Team that same year. I went on to qualify for the 44th Amsterdam Waterland Marathon in April 2016. This was huge milestone for me and I came first in the 14km race. This was my first big win and it sparked the rest of the season for me. What have been your favourite competitions? I really enjoyed my first Sprint International which was in Piestany, Slovakia in May 2017. Myself and my race partner took part in the K2 500m, a European qualifier for the U18 Sprint Championships, and we qualified! We went on to compete in the U18 European Championships in Bulgaria representing Great Britain. It was incredible, and I can remember the trip vividly. Many people felt I wasn’t ready for that level of competition, but I had the self-belief and felt the hard work I had put in would pay off. I have overcome so many challenges. For me this journey has been about achieving something I never thought possible. In May 2018 my K2 partner and I took part in the World Cup 1 Championships in Hungary and the World Cup 2 in Germany. We were the youngest to compete in the Senior races, so it was tough! We managed to get through the heats and the semi-finals and made it to the B Final where we came 14th in the world. In 5 out of our 6 races, we achieved personal bests. What does the support of Charterhouse Club mean to you? More than anything as I haven’t had sponsorship before. In our sport there isn’t much in the way of sponsorship or funding. Training at the Club involves a mix of gym and swimming and running on the outdoor track. I train for 30 hours a week incorporating a mix of cardio, strength and mobility. I am also pleased to be on the Lifeguard course because finding a job that fits around my training and university studies is tough. Training to become a lifeguard at the Club will be beneficial as it is flexible.